San Francisco is brimming over with new restaurants - classy ones, bargain joints, regional culinary haunts and more! Japanese restaurants serving Sushi are widely sought in San Francisco. Look up our restaurant guide to the city of San Francisco. Find out various dining options. Sample Afghan kebabs or organic California-style food or raw foods - San Francisco restaurants have it all! The best steaks in San Francisco can be found at Alfreds in the Financial District. Don't miss on the fine mouthwatering broiled steaks. Gourmet steak lovers would enjoy the magnificent Chateaubriand, Chicago rib steak and the fresh salmon fillets. The broiled rack of lamb is another favorite on the menu of this popular restaurant in San Francisco. Enjoy your tea at some of the fine tearoom restaurants in San Francisco. The traditional English tea is served along with sandwiches at the Lovejoy's Tea Room. The Samovar Tea Lounge is a tea aficionado's delight. For over a century, the Garden Court at the Palace Hotel in San Francisco has been the ideal setting for an afternoon tea. You can enjoy an elegant tea service at the Ritz Carlton lounge. The Imperial Tea Court in Chinatown has traditional snacks along with Chinese tea presentations. An afternoon cuppa at the Windsor Tea Room of the King George Hotel in San Francisco is the chosen venue for formal presentations. Other options are the Japanese Tea Garden and the Teavana. If you are looking for a bargain meal, our restaurant guide of San Francisco can help you. Wood roasted chicken at Chicken Chicken in downtown Burlingame offers a quarter chicken with your choice of two side dishes at just $7.25. A middle-eastern style rotisserie chicken meal for two or three can be found for $11.95 at the include Goood Frikin' Chicken restaurant in San Francisco. For the quintessential American breakfasts and lunches, check out Giant Chef at Contra Costa Boulevard on Pleasant Hill. Binge on a burger and root beer freeze at Joe's Cable Car. La Taqueria has been serving burritos for over 3 decades and offers delicious fruit drinks and Carnitas. For Burmese and Mandarin delicacies, try out the Mandalay on California Street. The green papaya salad and tea leaf are remarkable. Enjoy batter fried fish fillets and thick chips at Edinburgh Castle pub or Old Chelsea for the traditional British flavor. The Saigon Sandwiches at Larkin Street offers French Vietname sandwiches on hot crisp rolls - banh mi. Succulent barbequed pork or chicken served with fresh cilantro, jalape?o and carrots, any restaurant guide to San Francisco would recommend them. For traditional Indian snacks, especially vegetarian ones, try Vik's Chaat Corner at Berkeley. The dining guide to San Francisco's Fisherman's Wharf ranges from sidewalk food counters to traditional Italian restaurants serving seafood. Sourdough bread from Boudin's is a must-have for any gourmet in San Francisco. It has been around for decades. Vendors sell Dungeness crabs or calamari salads. Lovers of Japanese food need not despair in San Francisco - you can find sushi and more! The Ponzu at Taylor Street is known for its contemporary Asian cuisine, be it Japanese, Chinese, Malaysian or Thai. Ebisu has been a popular favorite with most as the best Japanese restaurant in San Francisco. Strayfish Sushi, as the name suggests is a Sushi joint located in the outer mission. You can take your pick from sushi and tempura, udon noodles and also relax in its beautiful interiors. Join the crowds at Ace Wasabi's Rock 'n' Roll Sushi for innovative sushi rolls and other favorites. 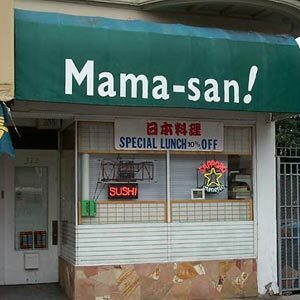 The Hamano Sushi is a popular Japanese restaurant in San Francisco that boasts of trendy interiors with a blonde-wood sushi bar - you can watch your sushi getting made. The Kyo-ya on New Montgomery Street offers much more than its signature 49er roll. Partake of multi course kaiseki meals and various maki and nigiri options. The Kabuto Sushi has nearly 90 sushi selections on its menu and the nasu dengaku (baked eggplant) is recommended. Order sashimi, maki and nigiri for a hearty meal at this Japanese restaurant in San Francisco.